3. 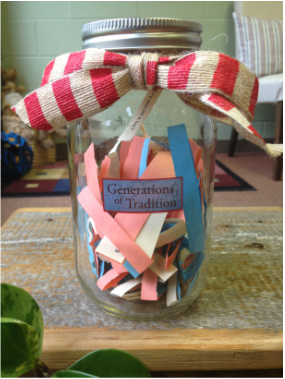 Tie a ribbon around the neck of the jar. The ribbon can overlap onto the ridges a bit. 4. Decorate the jar with stickers. 2. Depending on how much time you have for your meal, pick one or more prompts to discuss. 3. Everyone should have a chance to answer the question. 4. This could be used at larger family gatherings or when a friend visits. 5. One or two prompts could be picked out before your family goes out to supper and then use them at the restaurant.